NVIDIA is rising through the ranks of the semiconductor industry as the company is growing at a rapid pace. 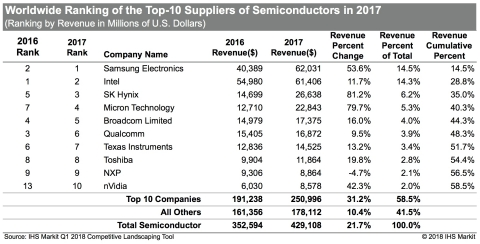 For the first time ever, NVIDIA managed to score a position on the list of the top 10 semiconductor vendors in terms of revenue. In 2017, NVIDIA sold $8.57 billion worth of products, representing a 42.3 percent growth versus the year before. NVIDIA came very close to the ninth spot, which is held by automotive chip maker NXP, but is still far removed from the others. Not that it really matters a lot, as lots of firms will be jealous of NVIDIA's mouthwatering profit margins. Interestingly, this makes NVIDIA part of a very select club. Only two other companies have ever managed to crack the top 10 list of chip suppliers in a calendar year. Qualcomm entered the list in 2007 and remained there, while MediaTek just got pushed out of the list by NVIDIA. Overall, global semiconductor sales rose 21.7 percent in 2017 to reach a record $429.1 billion. It was the highest year-over-year growth for the industry in 14 years. Most of the industry's sales gains were driven by a blockbuster year for memory chip sales, which increased by 60.8 percent from 2016. Outside of memory, the rest of the semiconductor industry grew by 9.9 percent last year, due largely to what IHS called solid unit-sales growth and strong demand across all applications, regions and technologies.